In a fantastic and depressing exposé, the Crimson White reports that at least four traditionally white sororities at the University of Alabama had their alumnae blatantly block two black women from pledging this year, women that current sorority members had already targeted as prime candidates who they wanted to offer bids to. The national headquarters of all four Greek organizations have denied having anything to do with pressing the chapters to reject these women. The Crimson reports that UA's Pi Beta Phi alumane said they would pull funding from the sorority if one of the women pledged. University of Alabama's traditional white sororities haven't pledged a black woman since Carla Ferguson pledged Gamma Phi Beta in 2003. She was also not coincidentally at all the first black woman to ever get a bid. Unfortunately for Ferguson, her acceptance was tainted by suggestions that the only reason the sorority offered her a spot was because of political pressure from the ominously named "Machine", a group of white sororities and fraternities, who allegedly threatened Gamma Phi Beta, telling them that their social calendar would improve if they let in a black woman. A few years before that, Melody Twiley attempted to Rush traditional white sororities two years in a row and was rejected both times. 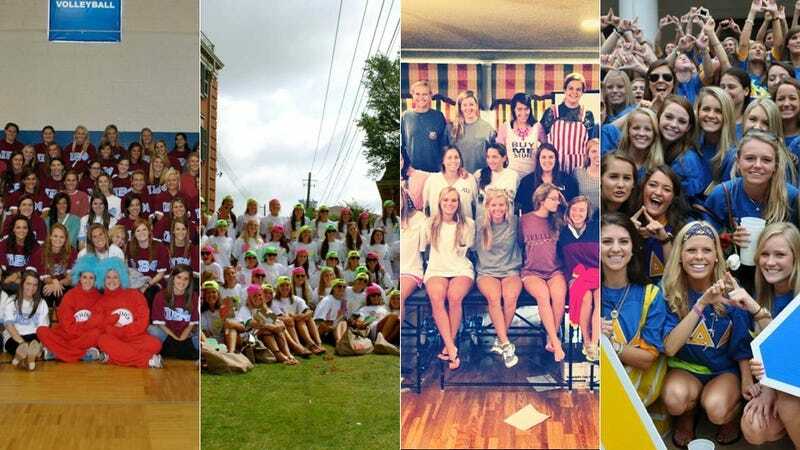 Ironically, just a month ago AL.com published a piece wondering if this was the year UA sororities would become more diverse, noting that the Greek organizations had begun to face slow but increasing pressure from school officials worried about the racial divide between their organizations. (UA is a school with a noted and famous history of racism.) In 2003, University president Robert Witt said he wasn't surprised that there weren't a lot of black women pledging sororities. “Number one, we’re not dealing with a large pool [of black women],” Witt said. “Number two, the first African-Americans who are accepted are going to be subjected to a lot of media pressure.” In the fall of 2012, 13 percent of UA students were black. Number three, who would want to join an organization whose former members are going out of their way to avoid them?